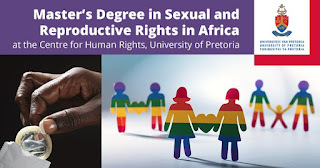 Centre for Human Rights, University of Pretoria Masters Degree LLM/MPhil (Sexual & Reproductive Rights in Africa) Scholarship Application Guidelines for 2019/2020 Academic Session. 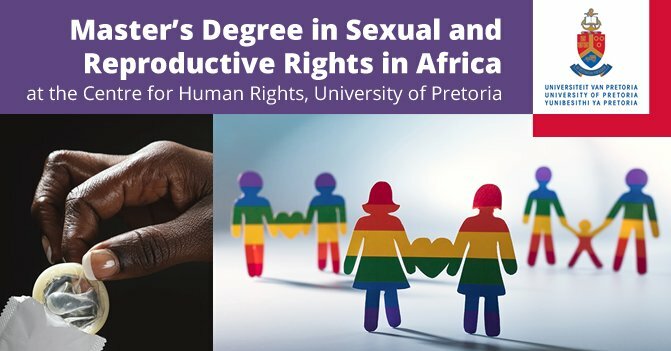 The Centre for Human Rights, University of Pretoria now offers a LLM/MPhil (Sexual & Reproductive Rights in Africa) degree. This two-year programme is offered as a blended learning course comprising of online interaction and residential block-weeks in Pretoria. Two contact sessions will be scheduled every year (four contact sessions over the period of two years). The LLM degree is open to individuals with a LLB degree or equivalent. The MPhil degree is open to non-lawyers with at least an honours degree in an academic discipline relevant to sexual and reproductive rights in AfricaOR any other qualification in an academic discipline relevant to sexual and reproductive rights in Africa that allows admission to a master’s programme at the institution where the undergraduate qualification was obtained. If that qualificatio has duration of less than 4 years, substantial proven practical or professional experience in sexual and reproductive rights in Africa, subject to the discretion of the Dean, is further required. Applicants must have excellent academic credentials and demonstrate human rights experience or interest. A maximum of fifteen students will be accepted for the 2019 academic year. Application deadline: 30th June, 2019. This is a selection course and applications must be submitted before 30th June, 2019 to be admitted to the 2020 academic year. Scholarships: UP TO 15 FULL SCHOLARSHIPS ARE AVAILABLE FOR AFRICAN CITIZENS.